While many children grow up playing sports in school or with community teams, not many go on to play competitive sports as adults. Enterprise Management Trainee Olivia D. is an exception. 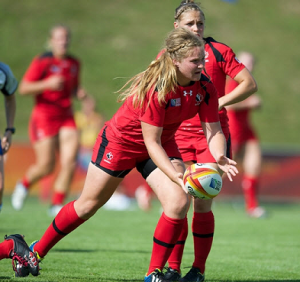 The New Brunswick, Canada MT was selected to represent Team Canada this summer at the 2015 International Women’s Rugby Super Series, where they took on New Zealand, the United States and England. Team Canada put up a good fight, but New Zealand ultimately took home the world championship trophy. While attending St. Francis Xavier University in Nova Scotia, Olivia competed in four National Championships and brought home gold twice. She also won silver playing for Team Canada at the World Cup of Rugby last summer in Paris.